The 463rd Troop Carrier Wing was one of the most historic units in the United States Air Force. Assuming the designation and lineage of the World War II 463rd Bombardment Group,which operated B-17s from Italy, the 463rd Troop Carrier Wing was activated at Memphis Municipal Airport, Memphis, Tennessee in 1953 and equipped with C-119 "Flying Boxcar" transports. When the USAF installation at Memphis closed, the 463rd transferred to Ardmore AFB, Oklahoma. In 1955 the wing's 309th Troop Carrier Squadron became the first squadron in the US Air Force to operate the new Fairchild C-123 Provider. The 463rd was also selected to be the first unit to equip with the new turboprop Lockheed C-130 Hercules. Several wing pilots and mechanics were chosen as "initial cadre" for the new airlifter. The first operational airplanes were delivered to the wing in December 1956. Shortly after the conversion, four pilots from the 774th Troop Carrier Squadron became The Four Horsemen, an aerial demonstration team that performed intricate maneuvers in the large transports. Ardmore was placed on the list of bases to be closed and the 463rd transferred to Sewart AFB, Tennessee where it joined the 314th Troop Carrier Wing, which had also converted to the C-130, and the two wings made up the 839th Air Division. The 839th supported Tactical Air Command and US Strike Command deployments throughout the world, including back-to-back deployments to Lebanon and Formosa in response to crisis situations on opposite sides of the world in the summer of 1958. Wing crews would be involved in numerous operations all over the world until the 463rd transferred to Pacific Air Forces to support the Vietnam War. The 1960s saw an increase in Tactical Air Command troop carrier forces, which led to the conversion of the 463rd and 314th to the new C-130B while their A-models went to other units. A further increase in troop carrier strength led to the transfer of the 463rd from Sewart to Langley AFB, Virginia in 1962. From Langley the 463rd supported United States requirements all over the world. Rising tension in Southeast Asia led to the deployment of 463rd squadrons to the Pacific, with TDY squadrons initially at Naha, Okinawa, then at Clark AB, Philippine Islands. When the United States began assigning C-130s for airlift duty in South Vietnam to support the buildup of troops in the rapidly esclating war, 463rd aircraft and crews on temporary duty in the Philippines began operations out of Saigon. In the spring of 1965 trouble in the Dominican Republic saw 463rd crews join other TAC and Military Air Transport Service C-130s in an airlift of the 82nd Airborne Division to San Isidro Airfield. In late 1965 the Air Force decided to increase airlift strength in the Pacific and the 463rd transferred from TAC to PACAF along with other TAC C-130 units; the 463rd became part of the 315th Air Division, with its new headquarters located on Mactan Island in the Philippines, along with the 772nd and 774th Troop Carrier Squadrons, while the 773rd TCS operated from Clark Field on Luzon where it was joined by the 29th TCS, which transferred to PACAF from its base at Forbes AFB, Kansas. The 463rd was one of three wings of C-130s from which aircraft and crews were drawn to supplement existing PACAF C-130 units for Vietnam operations. On July 1, 1967 all USAF troop carrier units were redesignated as "tactical airlift" and the 463rd became the 463rd Tactical Airlift Wing, while its squadrons became tactical airlift squadrons. The change, which was a simple matter of paperwork, was due to a realignment of airlift forces and the new title was selected because it allegedly better described the mission. Because of the superior short-field capabilities of the B-models, the 463rd was assigned to support forward field operations in III Corps, thus leading to the most difficult of airlift assignments in the 1966-67 time period. Wing crews operated from an advance base at Tan Son Nhut Air Base outside Saigon. 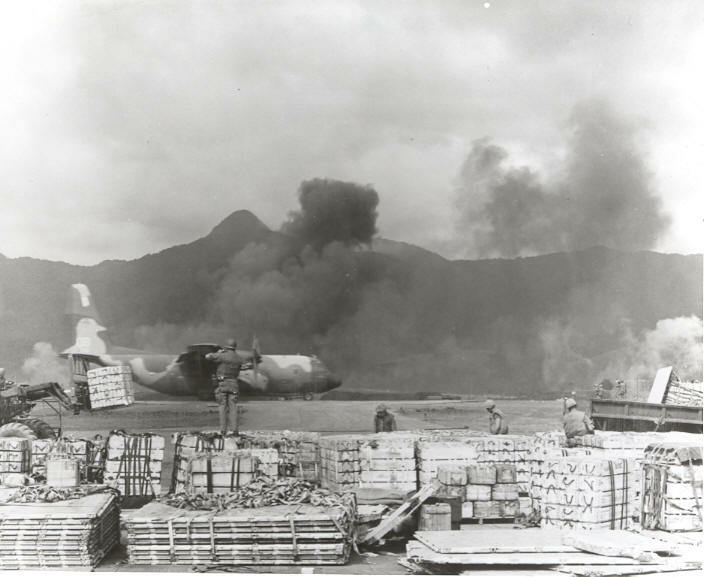 The Tet Offensive of 1968 and the simultaneous siege of the Marine Combat Base at Khe Sanh placed 463rd crews in the most dangerous conditions faced by airlifters during the period of US involvement of ground troops of the war. Crews from the 463rd joined other C-130 crews in the vital - and dangerous - resupply missions over the besieged base. 463rd crews airdropped supplies to units of the First Cavalry Division when they went into the A Shau Valley in the spring of 1968. A wing airplane and crew were lost to enemy fire. Kham Duc is a name that will forever live in C-130 history - one 463rd crew was shot down during the evacuation of the camp. All told, the 463rd lost nine C-130s to enemy action in Vietnam, of which five were shot down and four were destroyed on the ground. Eight others were lost to operational causes. At least 45 463rd personnel lost their lives in crashes and several suffered wounds. Two 463rd maintenance personnel were killed by hostile fire while on the ground at a forward base where they had been sent to repair a broken airplane. The 463rd headquarters remained at Mactan until mid-1968, when the wing and the 772nd and 774th squadrons transferred to Clark Air Base to join the 29th and 773rd. Although the 463rd was part of the 315th Air Division, the wing's airplanes and crews were under the operational control of the 834th Air Division, a unit that was established in Saigon to control all US Air Force airlift in South Vietnam. Wing crews rotated initially to Tan Son Nhut until the spring of 1969, when the rotation moved to Cam Ranh Bay. Rotations were of 16-day duration, during which the crew would fly missions as scheduled by the 834th Airlift Center in Saigon. Maintenance and other personnel served in South Vietnam for periods ranging from two weeks to six months at a time. In the spring of 1969 the Air Force deactivated the 315th Air Division, at which time the 463rd became part of the Clark-based Thirteenth Air Force, the controlling agency for Pacific Air Forces units in Southeast Asia, including the Philippines. The 20th Operations Squadron also became part of the 463rd at this time. The 20th, previously another 315th AD unit, operated an assortment of transport aircraft, including C-118s used for air evacuation of patients from hospitals in Vietnam to Clark and a quartet of large Douglas C-124s that transferred to Clark when the Military Airlift Command phased out its fleet of Globemasters. The C-124s operated into and within Southeast Asia carrying "outsize" cargo that was too large for C-130 lift. In early 1969 the 463rd began COMMANDO VAULT, a special project involving the delivery of 10,000-pound M-121 bombs to create "instant" helicopter landing zones. The 10,000-pound bombs were replaced by more powerful 15,000 Blu-82 bombs when the supply of M-121s was used up. The huge weapons were detonated all over South Vietnam to create LZs and sometimes against communist troop concentrations. The invasion of Cambodia in the spring of 1970 began with the detonation of a pair of Blu-82 bombs. Blu-82s were also used in Laos for Operation Lam Son 719. In 1970, after the Cambodian Incursion, in which 463rd crews played a large role, President Richard Nixon began withdrawing troops from South Vietnam as he had promised during the 1968 presidential campaign. Several C-130 units were slated for deactivation, including the 463rd. The 29th TAS was the first to go; it deactivated in August 1970 and its personnel transferred to the other squadrons. The 463rd Wing survived for another year. The wing inactivated on December 31, 1971. The 774th Tactical Airlift Squadron remained active at Clark until mid-1972. With the inactivation of the 463rd, the wing's history came to a close. Subsequently, the unit designation and lineage was given to a Tactical Air Command C-130 wing at Dyess AFB, Texas, (the 516th TAW) where it remained into the 1990s. The designation then passed to an Air Mobility Command mobility group at Little Rock AFB, Arkansas which inherited the lineage of the old 463rd. It has since been inactivated and the 463rd is no longer part of the active Air Force.